Dry needling is a technique that treats the neuromusculoskeletal system and is based on pain patterns, muscular dysfunction, and other orthopedic signs and symptoms. Acupuncture is a technique for balancing Flow of Energy or Life Force known as Chi, believed to flow through meridians or pathways in the body. Dry Needling does not follow this Acupuncture philosophy but rather, is based on modern science and anatomy. The only real similarity is that both techniques use a thin, monofilament needle. 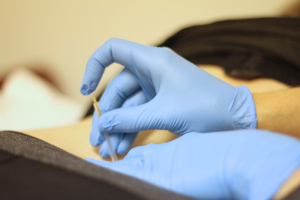 In Dry Needling, the needle penetrates the skin to stimulate myofacial trigger points for the management of pain and movement impairments. It also works to desensitize structures, restore motion and function and induce a healing response to the tissue. It does this through a cascade of events that occur once the tissue is penetrated, leading to increased blood flow and blood vessel formation, which promotes tissue repair. Dry Needling is very effective in treating tight muscles and improving muscular pain. The practice of Dry Needling has been around for decades, and stands as one of the most effective treatments in the world of rehabilitation. Dry Needling can be performed by a licensed physical therapist who is certified in the technique. In the state of Georgia, you must have a prescription for physical therapy from a physician to receive the treatment. Call Stability today (404-303-9153) to make an appointment with a PT for Dry Needling or click here to visit our website and learn more about Dry Needling.